Two pieces of debris recently discovered along the coast of Mozambique are "highly likely" to have come from missing Malaysia Airlines Flight 370, Australian and Malaysian officials said Thursday. SYDNEY (AP) — Two pieces of debris recently discovered along the coast of Mozambique are "highly likely" to have come from missing Malaysia Airlines Flight 370, Australian and Malaysian officials said Thursday. Flight 370 disappeared on March 8, 2014, with 239 people on board and is believed to have crashed somewhere in a remote stretch of the southern Indian Ocean about 6,000 kilometers (3,700 miles) east of Mozambique. Authorities had predicted that any debris from the plane that isn't on the ocean floor would eventually be carried by currents to the east coast of Africa. One of the parts in Mozambique was discovered by American lawyer and part-time adventurer Blaine Gibson, of Seattle. Gibson, who has been searching for Flight 370 over the last year, found the piece on a sandbank. Gibson said he hopes the part can provide investigators some leads into where and how the plane crashed, but that he felt little joy over the news that his discovery almost certainly came from Flight 370. "I do not use the word 'happy,'" Gibson said by telephone from Myanmar, where he was visiting friends. "Because 'happy' — that is how I would feel if I arrived on that sandbank and found all the passengers and crew alive, sipping on coconuts and grilling seafood and saying, 'What took you so long?' That would make me happy. However, we're after the truth — whatever it is." Soon after Gibson's find was publicized earlier this month, a South African teenager realized a piece of debris he'd found on a beach during a family vacation in Mozambique might also be from the plane. Liam Lotter came upon the grey piece of debris while strolling on a beach in southern Mozambique in December and thought it might be from an aircraft. 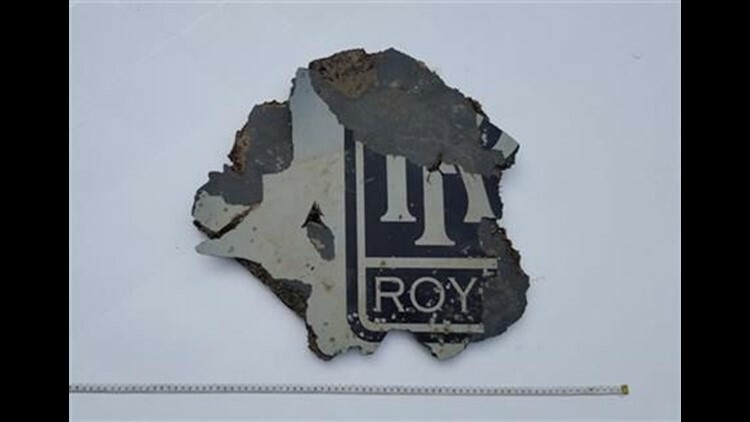 Earlier this week, an archaeologist walking along South Africa's southern coast found a piece of debris with part of an aircraft engine manufacturer's logo. Liow, Malaysia's transport minister, said there is a possibility it came from an inlet cowling of an aircraft engine. Authorities will examine the part to see if it, too, came from Flight 370.